Tony Randall starb nach einer Herzoperation am 17. Mai 2004 in New York an einer Lungenentzündung. Er war zum zweiten Mal verheiratet und hinterliess zwei Kinder. Tony Randall wurde 84 Jahre alt. Jack Klugman verarbeitete seinen Schmerz mittels seiner Liebeserklärung an Tony Randall in Form seines Buches "Tony and me". I was walking into the chapel when an attendant handed Klugman the printed program with a lovely color portrait of Randall on the cover. He nearly lost it. 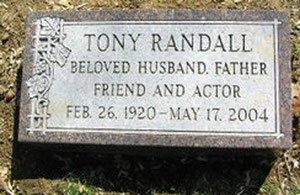 Later, during his eulogy, Klugman said, "A world without Tony Randall is a world I will never recognize." I will tell you that in the month since I last saw him, during which Randall was in intensive care from pneumonia following heart surgery, Klugman looks like he's aged considerably. It's obvious Randall's decline and death have had a huge impact on him. How rare that two actors from a sitcom that ended its run almost three decades ago would still be such close friends. The praise for Randall was effusive with a series of anecdotes attesting to his largesse, his love of actors and acting, and the love for his new family: wife Heather and children Julia and Jefferson. There was much mention of the couple's huge age disparity -- 50 years -- having meant nothing when they found each other. 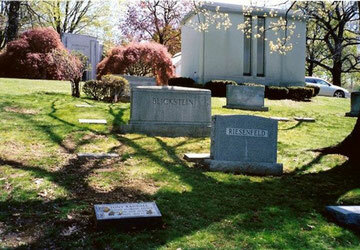 Outside the funeral parlor, after Wallach, Klugman, Giuliani and Cliff Robertson all spoke, and after opera great Sherrill Milnes sang, Stiller told me a story. "Tony called me in 1993, when I thought my life was over. It was right before I got 'Seinfeld.' He said, 'What are you doing?' I said, 'Nothing.' He said, 'I have a part for you in 'Three Men on a Horse.' It's the third banana. But it's a good part.' I said, 'Fine. Do I have to read for it?' He said, 'No you don't have to read for it. Just bring your coat.' It turned out I had a coat he liked, black and white check, like a zebra. That's what he wanted," Stiller said, holding back tears. 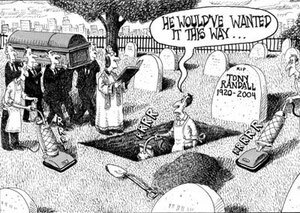 Tony Randalls letzte Ruhestädte liegt im Westchester Hills-Friedhof. Viele Fans pilgern noch heute zu ihrem Idol.